Computers are continually getting faster and faster and components seem to be getting smaller and smaller. Along with that mSATA drives are also gaining in popularity. Not only are they fast like their full sized mSATA counterparts, they are also significantly smaller in size. Up for review today is a 256 Gb mSATA drive from Kingston. The Kingston mSATA drive came in a small, plastic molded box, much like you typically find in memory sticks. It was just a standard box custom molded to fit the devise with a clear plastic cover so you can see the device. Quality of materials as well as construction was very good, similar to your standard computer components such as memory sticks. You could see the sanforce controller chip as well as the actual memory chips in other devices slaughtered to the board. Sautered connections were clean and secure as I have come to expect with Kingston components. Overall, it was a well made product. mSATA drives have come long way having the same speed as a standard SSD drive, they are significantly smaller and now their capacities can be found in excess of even 256 Gb. With that size and capacity, they make for a legitimate option for a primary drive in a modern laptop with a mSATA slot. Previously used by some manufacturers to improve drive speed and performance, they can now be used such as with the Kingston drive as a full primary drive instead of just as a catch. When compared to a traditional platter based hard drive, these SSD drives can be very fast. Especially when paired with a controller such as the sanforce as Kingstone had done with this drive. Installation was quite simple. It was a lot similar to upgrading to higher speed memory. My Lenovo laptop came with a mSATA slot and even came with a small 32Gb cache drive to improve the performance of my standard platter drive. Installation was very simple having the computer powered off, I simpley took off the back cover, unscrewed the one screw holding the mSATA drive in place took out the included small included mSATA drive, slid the new Kingston drive into place then pressing down on the drive, I reattached the screw to hold the drive in place. After reattaching the bottom cover to my laptop, I was then ready to reinstall windows onto my new Kingston mSATA memory drive. Performance was impressive! As listed from the specs, it will go up to 540MB/s read and 530MB/s write. 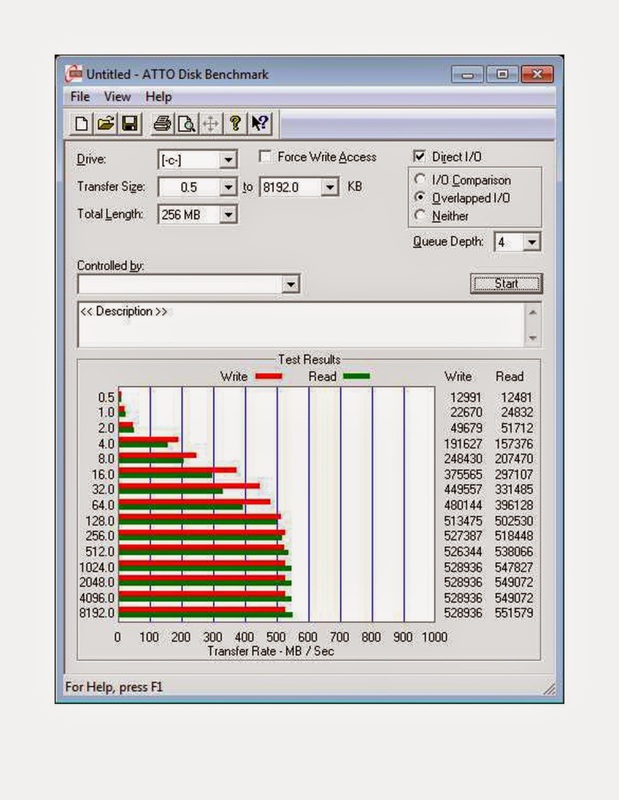 And as you can see from ATTO Disk Benchmark, it was over 550MB/s read, and just a hair under the 530MB/s write. It you want screaming performance in a small size, this mSATA drive is the way to go! With an MSRP is $249, it is a good value, especially when space is a premium. Based on it's design, features, quality, and specs, the Kingston SSDNow mS200 mSATA drive has earned our Editor's Choice Award. For more info and complete specs, check out their website as www.kingston.com.